Welcome to the official website for the book The Intergalactic Adventures of the Rainy River Bees. The book blends the action of hockey with the wonders of science fiction, and is written for a middle grade (9+) audience. It’s full of great illustrations and graphics, and includes a full glossary of Intergalactic Hockey terms. 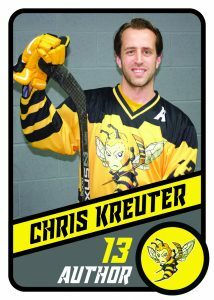 Chris Kreuter has loved science fiction and hockey his entire life. When he’s not being an engineer, you’ll find him reading, writing books, designing board games, playing hockey, or cheering for his beloved St. Louis Blues. He lives in New Jersey with his wife and two cats.